If you're experiencing problems displaying elements using the Underlay property of a Revit view, the feature just might be behaving as designed. We recently had a team working on a high-rise project and they wanted to use the Level 8 plan as an underlay for the Level 5 design. In other words, using a level above as a reference for a lower level. PROBLEM: The walls didn't show, but plumbing fixtures did. As a matter of fact, it seemed like anything that was supposed to be cut in plan view was not showing. We tried just about everything to fix the problem...changed the view discipline, checked the phase filters, and so on. It turns out that the View Range settings are crucial to the behavior of underlays. If EITHER the host view or the underlay have the View Depth set so that the views 'cross' each other - cut object styles will not be displayed. This usually happens when View Depth is set to Unlimited. While this seems to make sense for an upper level that uses a lower level as an underlay, it behaves the same way in the opposite. 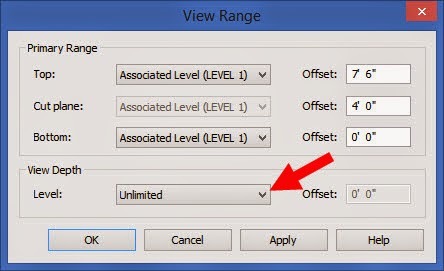 If the View Depth of the upper level includes the lower level within the view range, Revit thinks the elements are already being displayed and does not show them in the underlay. I thought you might be interested to learn that there’s a first ever AEC application with the Oculus integration in development, and you might want to try it yourself. My team is finalizing the integration now, and we’d be happy to provide you with such an opportunity. The app will allow AEC professionals and their clients to explore building design and construction projects in a truly immersive virtual reality. Please reach me via n.bauman@revizto.com if you’re interested in details. Very informative and useful post and thanks for share. I have had similar visibility issues and have not been able to get my model to fail in the way you describe. Currently I am using Revit 2016 and have found that unless my walls extend completely to the level above the level being underlaid then they will not show up. This if fairly discouraging since in the past I have used groups to copy my core demising walls in residential multi-family construction from level to level, and usually I can underlay my walls for reference. I typically offset the unit interior walls (which are also groups) about -2' to so in section they only show to the bottom of the ceiling/floor element. Level 2 - Core demising walls that extend from Level 2 to Level 3.
and so on to roof. If I then go to my level 1 plan and select underlay option my walls show up, however if I change my wall extents from base = level 2 top = Level 3 to top = Level 3 (-)0'-1" I will no longer see the underlay this has no relation to the view depth settings as I've tried to get both my working file to fail in this way and a test file that I tested my concept in and neither were bothered in the slightest by the view range settings only by the wall height offset. As soon as the wall fell short of meeting the level it would be omitted from the underlay. Very frustrating, any thoughts on how to fix this aside from not cutting my walls short? The thing to understand with underlays is that they are not "views" so they do not have a view depth, cut height or range themselves - they have a bottom level (the one you choose) and a top level (the next one above) - ie. they have a height range for model objects to be seen, which might be very small if you have levels close together (say a structural floor and finished floor level).